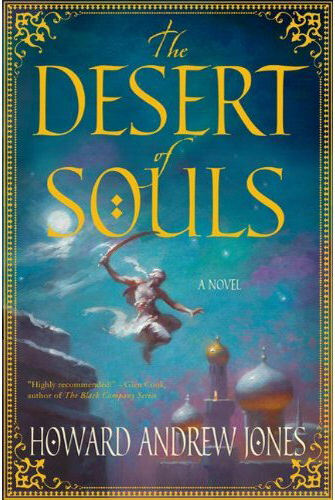 The Desert of Souls, the debut novel by Howard Andrew Jones, was released this past Tuesday, February 15th. St. Martin’s Press is offering a contest, giving away five copies of the book. You can enter here on their website. They also have a nice excerpt for you to check out. As richly textured as an antique rug, this fantasy-mystery sweeps readers into ancient Baghdad. Asim, captain of Master Jaffar’s guard, and the wily scholar Dabir, who is hopelessly in love with Jaffar’s niece Sabirah, track stolen golden artifacts into the shifting sands that hide the ruins of legendary Ubar, entry to the land of the djinn. Asim’s dazzling swordplay, his Muslim piety, and his unwavering loyalty to his friend balance Dabir’s bittersweet devotion to Sabirah as the pair battle forbidden magic that forces them to slice away layers of their own spirits. Their antagonist, evil Zarathustrian sorcerer Firouz, poses moral questions that deepen this multicolored Arabian-nights tale, as does the plight of pretty, quick-witted Sabirah, who prizes scholarship and lives for the moment while facing the fate of a political marriage. A captivating setting and well-realized characters make this a splendid flying-carpet ride.